Norwegian duo Run Sagevik and Josten Dahl Gjelsvik, produce music that is one hundred per cent based on the experiences they endure from where they reside. If we are to believe the press blurb, they actually collaborate together in a cabin high up in the mountains situated between the small villages from where they live and Pjusk is their take on the climate and landscape that surrounds them. ‘Tele’, is the Norwegian word describing frozen underground water and in musical form the two have tried to describe the essence of such a vision; without a doubt, there is nothing warm about this release, it is cold, unforgiving and sets the scene effectively the moment you hit play. 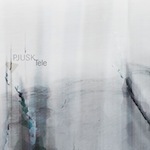 Pace is a key weapon in Pjusk’s arsenal; like snow drifts in an unrelenting wind that soars above the underground caves, you can almost imagine yourself sat in the cavernous dark depths with nothing but the pale ghostly walls of ice for company. Blissful pad work is utilised effectively on this release, offsetting the truth that lies within such an environment; for when a place is as harsh as this, you cannot argue that there is a beauty and purity that accompany the vast emptiness of civilisation. Best taken in one sitting for maximum effect on the senses, ‘Tele’ is the soundtrack to a silent documentary of an environment that few will ever witness.